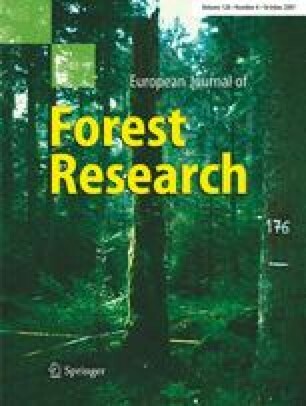 The above-ground biomass and production, below-ground biomass, nutrient (NPK) accumulation, fine roots and foliar characteristics of a 8-year-old silver birch (Betula pendula) natural stand, growing on abandoned agricultural land in Estonia, were investigated. Total above-ground biomass and current annual production after eight growing seasons was 31.2 and 11.9 t DM ha−1, respectively. The production of stems accounted for 62.4% and below-ground biomass accounted for 19.2% of the total biomass of the stand. Carbon sequestration in tree biomass reaches roughly 17.5 t C ha−1 during the first 8 years. The biomass of the fine roots (d < 2 mm) was 1.7 ± 0.2 t DM ha−1 and 76.2% of it was located in the 20 cm topsoil layer. The leaf area index (LAI) of the birch stand was estimated as 3.7 m2 m−2 and specific leaf area (SLA) 15.0 ± 0.1 m2 kg−1. The impact of the crown layer on SLA was significant as the leaves are markedly thicker in the upper part of the crown compared with the lower part. The short-root specific area (SRA) in the 30 cm topsoil was 182.9 ± 9.5 m2 kg−1, specific root length (SRL), root tissue density (RTD) and the number of short-root tips (>95% ectomycorrhizal) per dry mass unit of short roots were 145.3 ± 8.6 m g−1, 58.6 ± 3.0 kg m−3 and 103.7 ± 5.5 tips mg−1, respectively. In August the amount of nitrogen, phosphorus and potassium, accumulated in above ground biomass, was 192.6, 25.0 and 56.6 kg ha−1, respectively. The annual flux of N and P retranslocation from the leaves to the other tree parts was 57.2 and 3.7 kg ha−1 yr−1 (55 and 27%), respectively, of which 29.1 kg ha−1 N and 2.8 kg ha−1 P were accumulated in the above-ground part of the stand. This study was supported by the Estonian Science Foundation grant No 5748 and 6472. We thank Mrs. Ester Jaigma for revising the English text.